Bus Stop Quarry is the easiest of all the quarries on the Slate to visit. Literally a stones throw from the road the routes can be access in seconds from the car. There is now a good mix of sport, trad and run-out slabs. Most of Bus Stop was re-equipped fairly recently, and most of the bolted routes are already safe with resined in eco-anchors. Exceptions are Meltdown, Wizz Bang. New bolt belay on Fools Gold. Takes the clean grey buttress on the extreme left side of crag. Very pleasant climbing past 3 bolts to twin lower off. NB the Lower off has been pinned to the crag behind after concern is was just a small perched block. The route starts at a clean slab in the middle of the wall below a cleaned overhang.Climb directly over this to gain a cleaned but shattered ramp(more cleaning needed-but will improve with traffic and my further input) Move right along the sloping ramp to a line of 3bolts leading steeply up to a double bolt and ring lower off .6 Bolts protect. FA: Colin Goodey,Sue Goodey & Diane Kelly.11th August 2009. This is the renovated version of an old route(Mud Slide Slim of 1986-following the obvious corner on the right) The route has been stripped of huge amounts of loose rock,heather,ferns,mud ,grass and dust and twin lower offs fitted-all aimed at making the route more popular.The route is potentially very good and will improve with further use. Colin Goodey, Sue Goodey and Diane kelly. 8th August 2009. A very pleasant natural line on the towering buttress up and right of the Jagged Face slab. Start in an obvious square cut recess on the left side of the buttress.Climb steeply through an overhang to gain easier but pleasant climbing above past three bolts to double lower off. FA : Colin and Sue Goodey 8th October 2009. 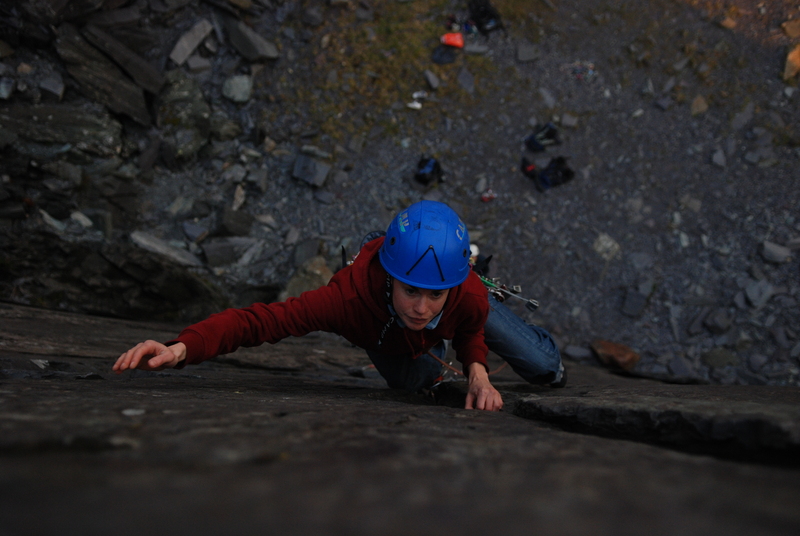 A classic E1 and one of the many trad climbs worth climbing in the quarries. Caution is starting to be needed as the flake that makes the ledge you mantel after the crux is slowly coming away from the crag. bold route with bouldery start to two spikes (possible skyhook) then hard moves v.poor wallnut 2 in flake on right. gain the pocket and place up to 4 cams! (size 00 to 2.5?) then easy runout climbing to final crux skhooks and poor RP to pull over the top! New sport route between Scare City and Forsinian Motspur. New sport route right of Forsinian Motspur. The direct finish to solstice is about E2 and now the starting flake has fallen off more in keeping with the rest of the route. Small words helpful. Basically from the top of the short layback section head straight up the small groove. Stirling Silver (E2 5c) Tried climbing this today (2012/12/02) and the first large suspect flake detached and now reside on the floor. Looks like several flakes above are loose too. APPROACH WITH CAUTION!!! My Hover craft is full of Eels F6b. New route on right end of crag, equipped and climbed by R Mirfin. 2006.